Or rather #followamuseum. Today is Follow a Museum Day started by Museum Marketing. A surprising number of museums are using twitter, certainly more than when I last looked into this for a presentation I gave in October, so today I created a twitter list of Dutch Museums so I can keep up with them. 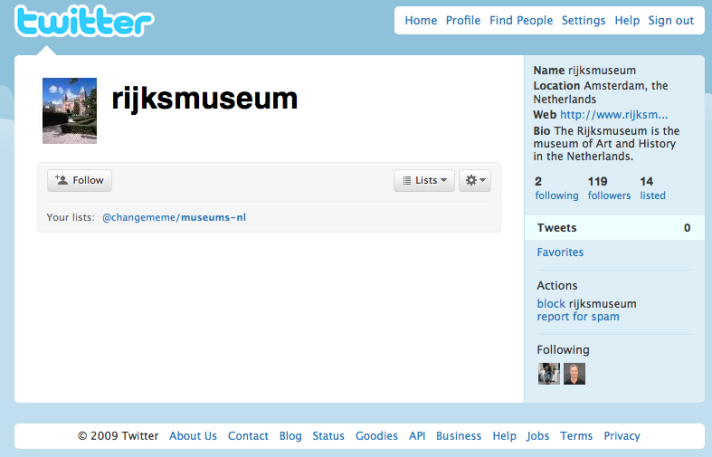 If you’re trying to find museums who tweet near you then followamuseum.com is the place to go. It seems to have been a success, some museums made special offers for their new followers for example the Willet Holthuysen Museum, other museums (many!) thanked and welcomed their new followers, while the Afrika Museum thanked their followers and reported on the growth in their number of followers. But there were some fails as well; not all museums reacted to the day, the fail whale for the Rijksmuseum. They’ve got 119 followers, but no tweets – not even one to thank those who started following them today. Why start an account? If there is no strategy and no resources don’t go there. Postscript: Thanks to @NickMoyes who pointed me to this tweet from Peter Gorgels who is the web manager at the Rijksmuseum. It seems their twitter account was hacked and it took around two months to get the account back – which they seem to have achieved on 29 January – although there are still no tweets on the account.